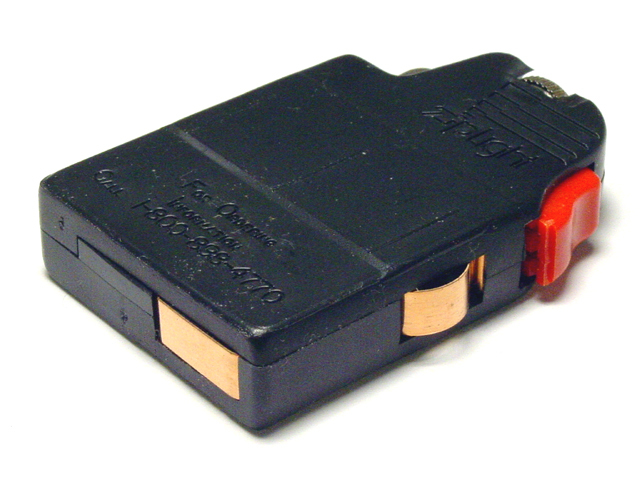 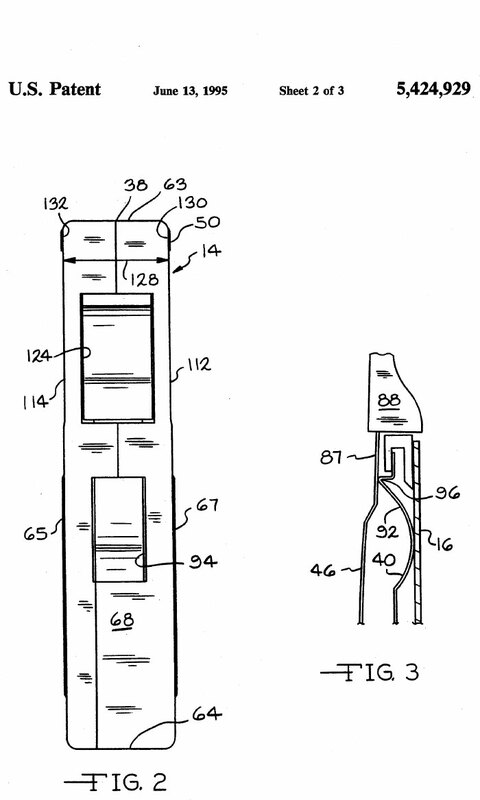 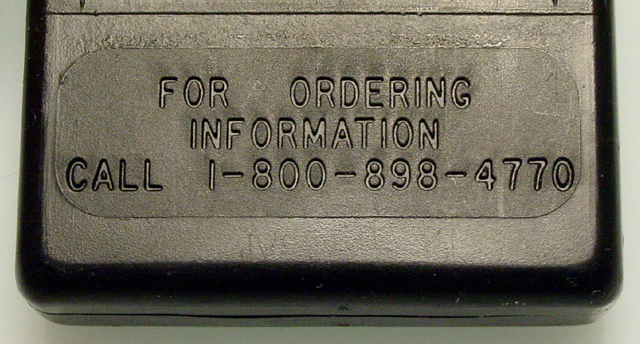 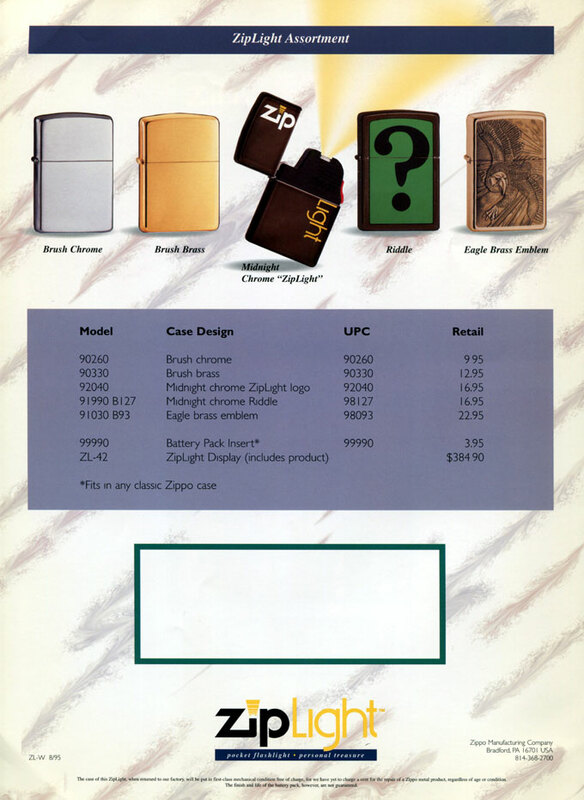 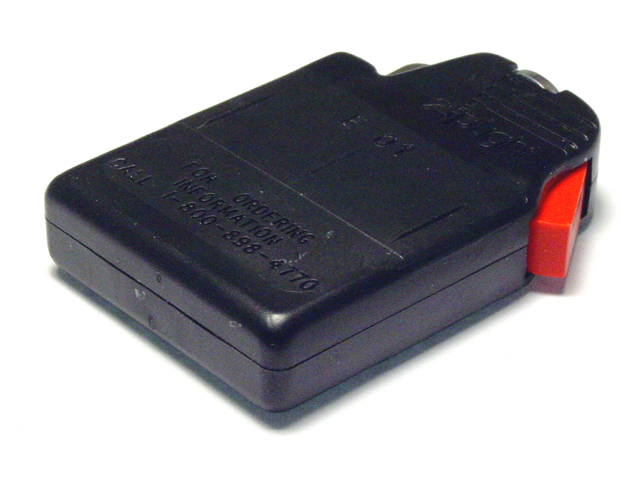 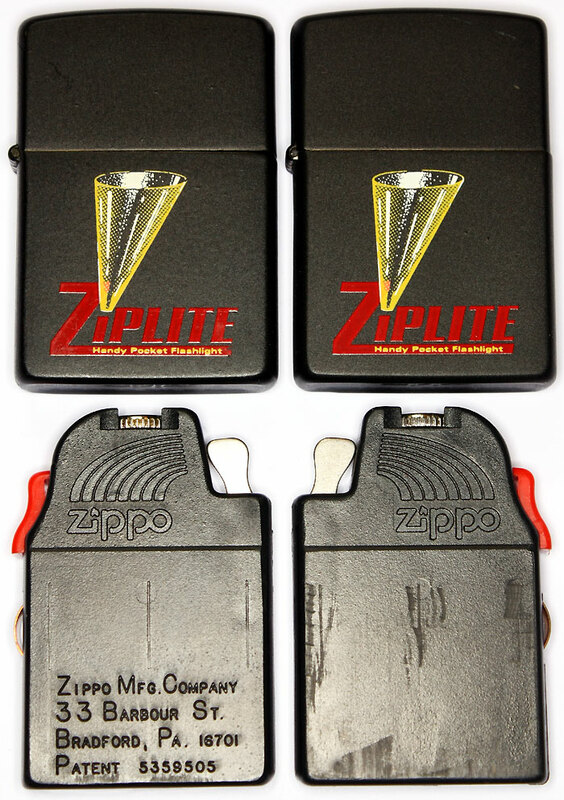 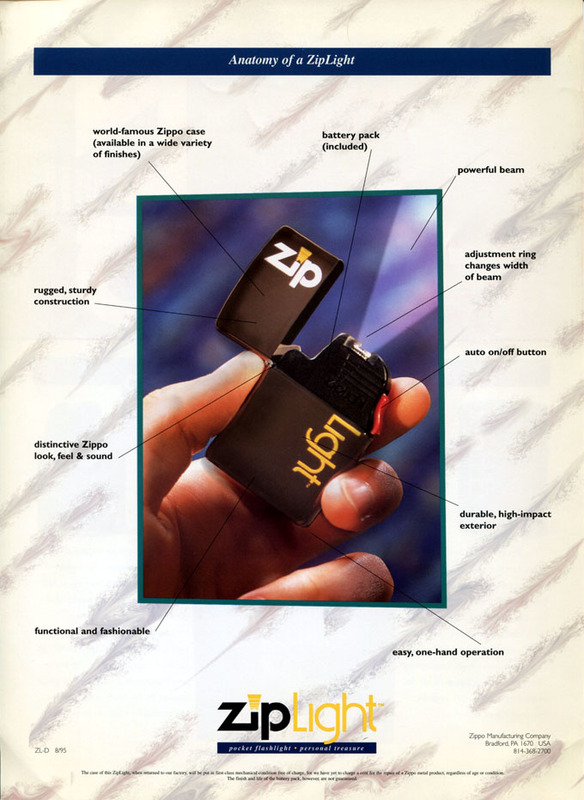 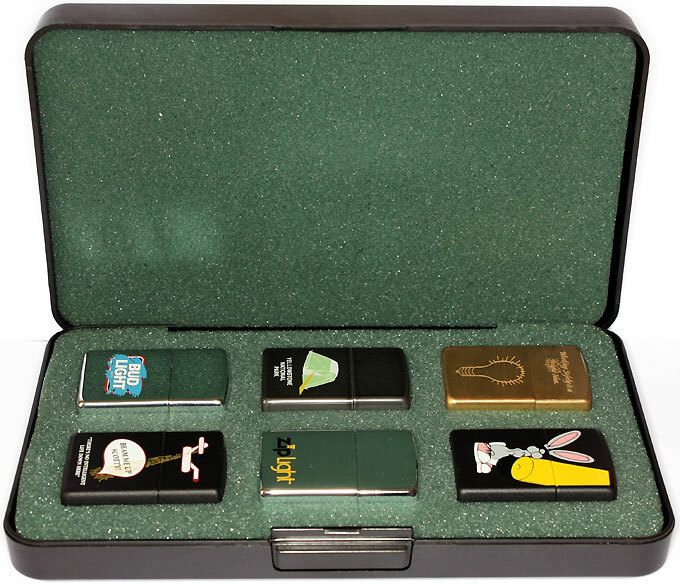 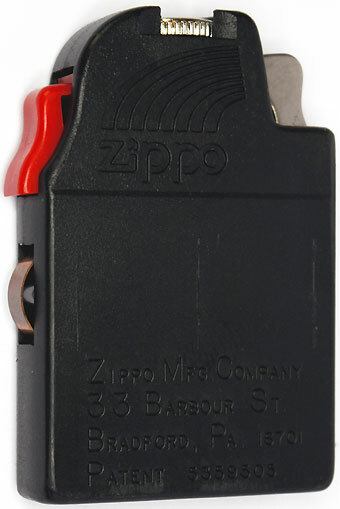 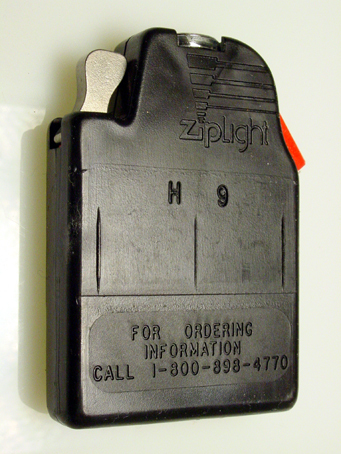 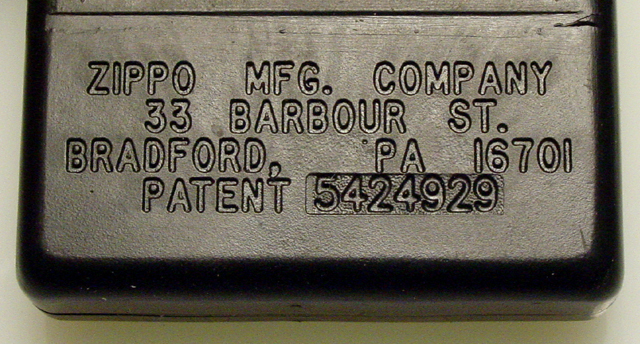 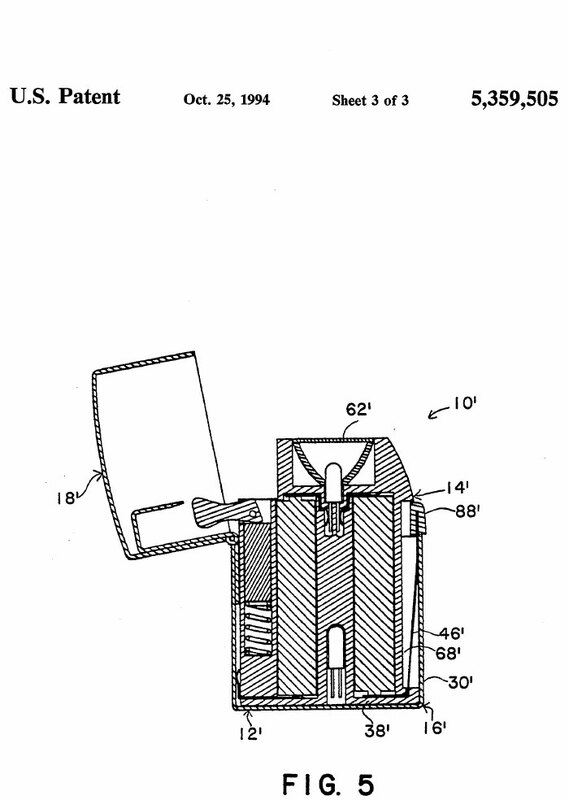 The inside units of the very first samples produced in March 1995 & given to Zippo's district managers only had a different logo and no date codes yet compared to the regular production run battery packs. 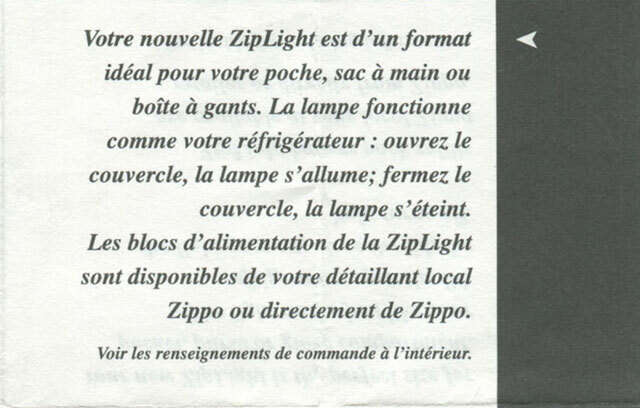 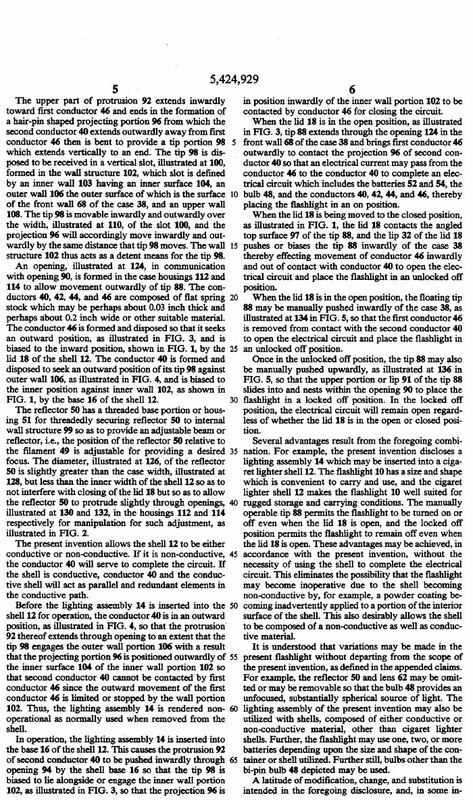 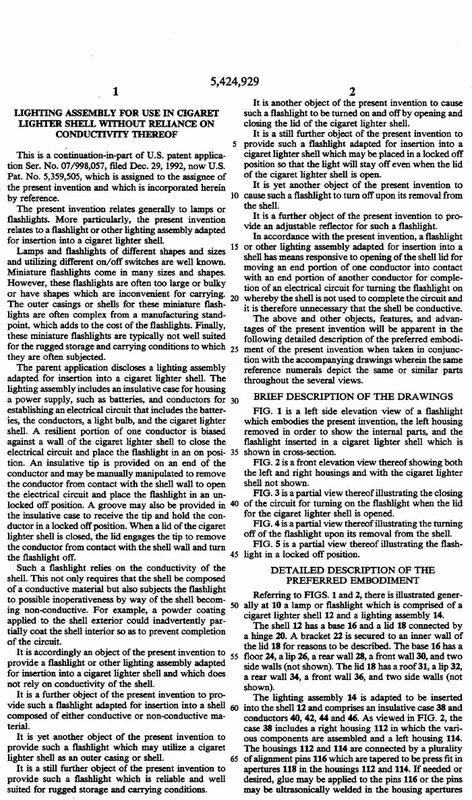 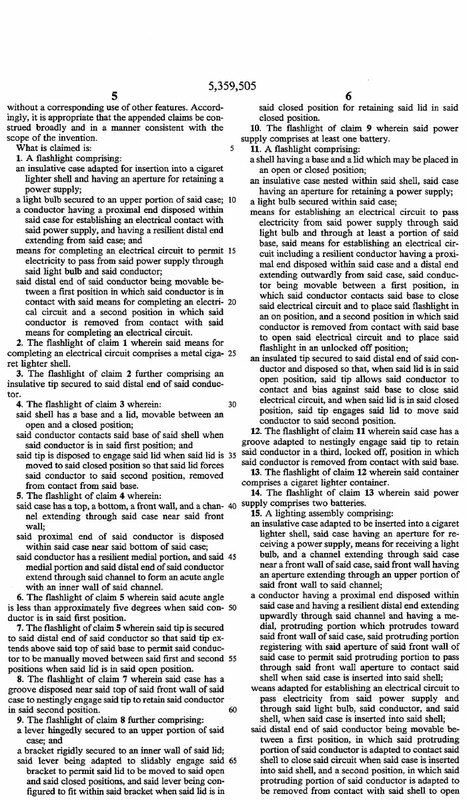 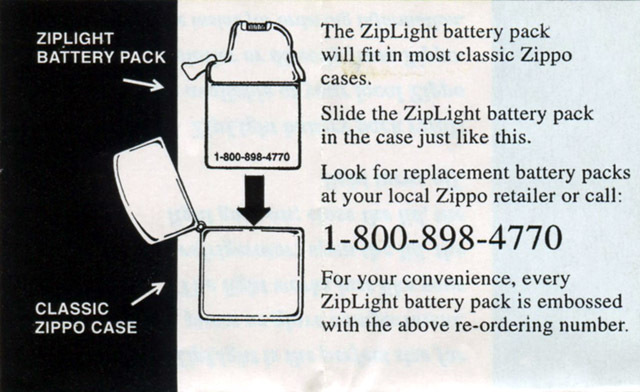 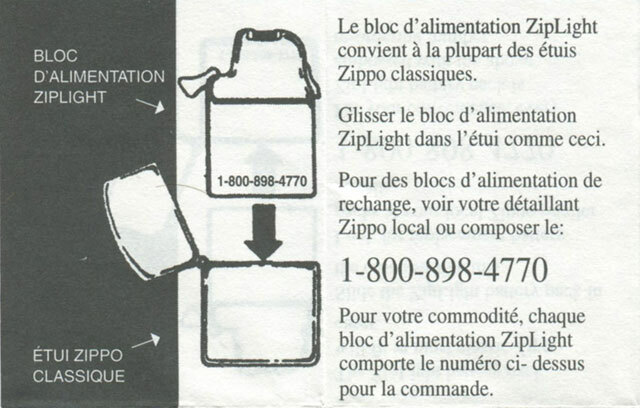 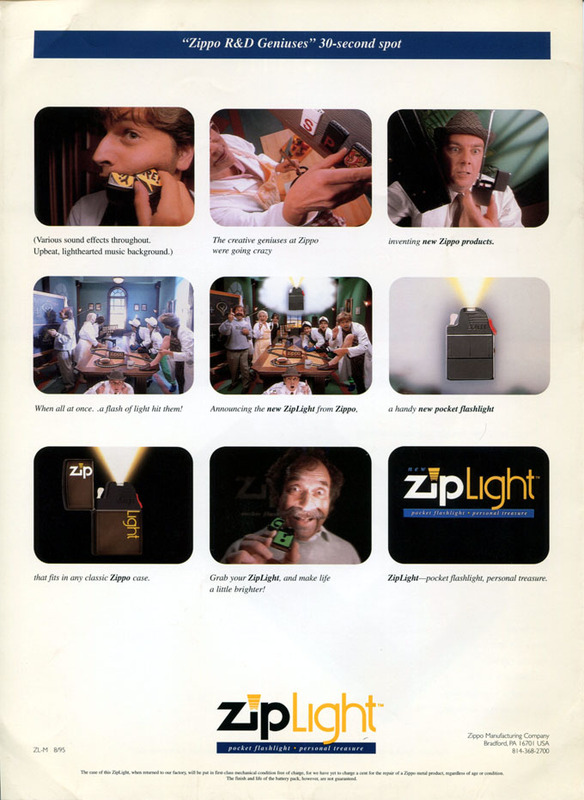 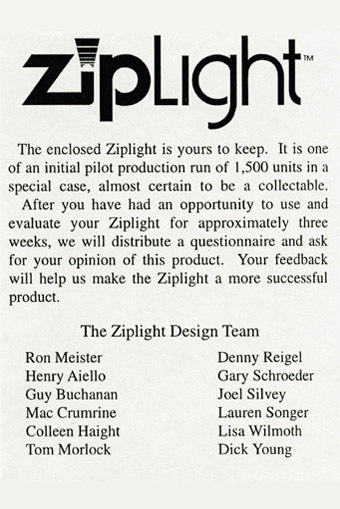 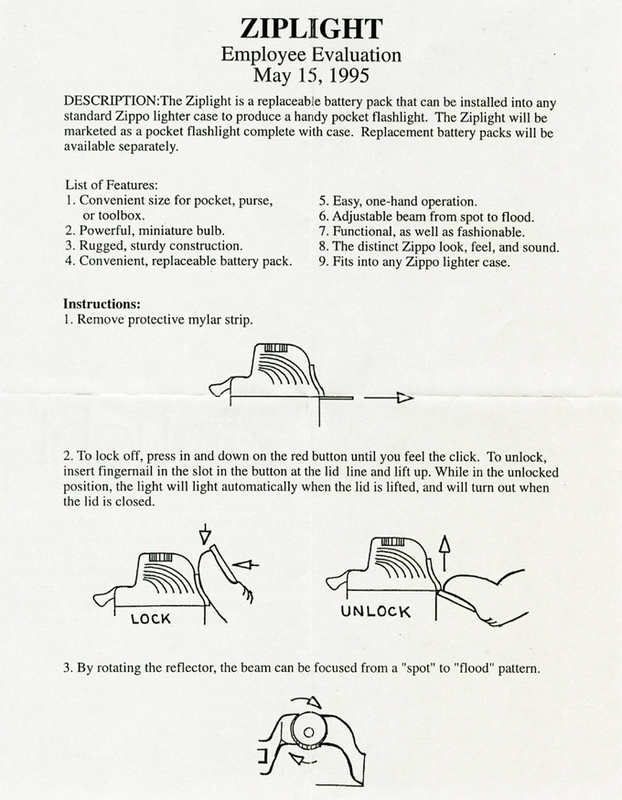 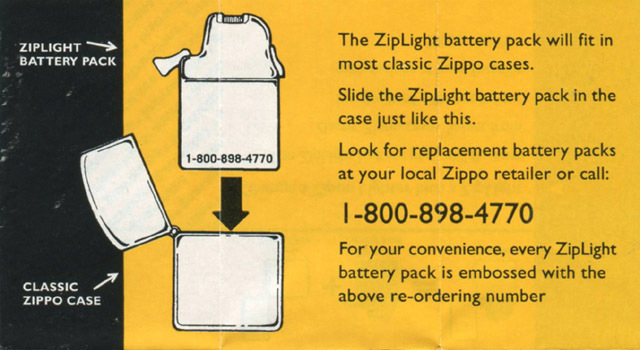 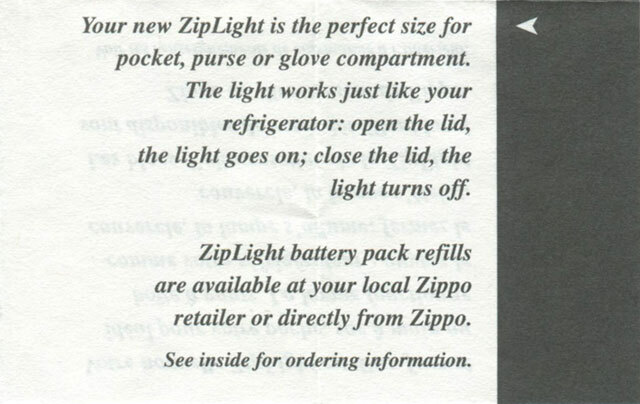 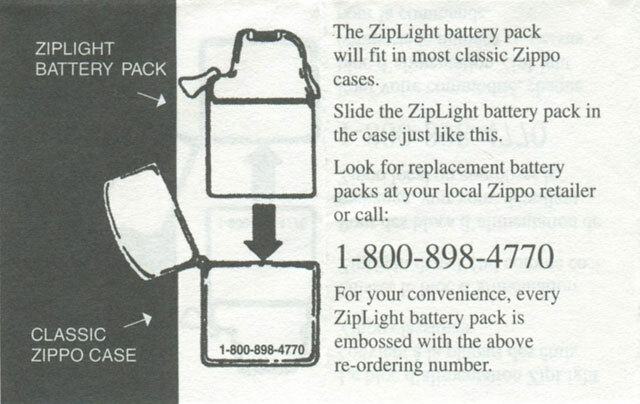 Each high polish chrome zipLight of the pilot run of 1.500 units came in a blister pack & enclosed a letter from the zipLight design team & the instructional manual as shown below. 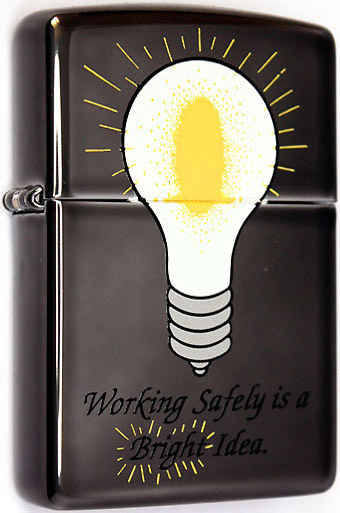 Working Safely is a Bright Idea. 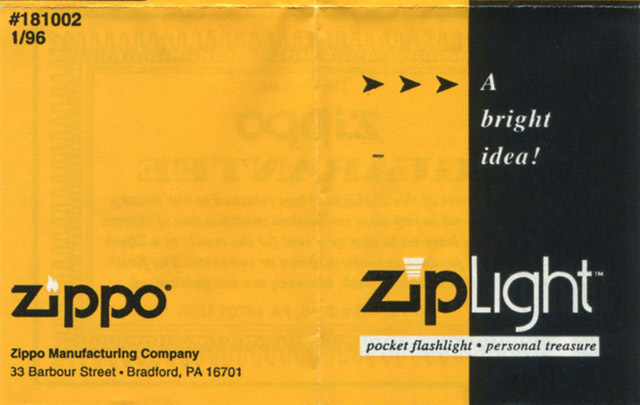 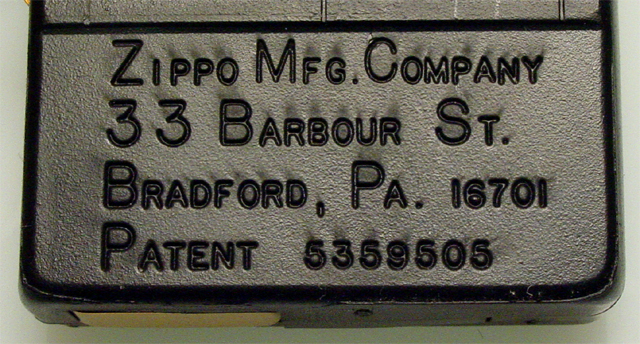 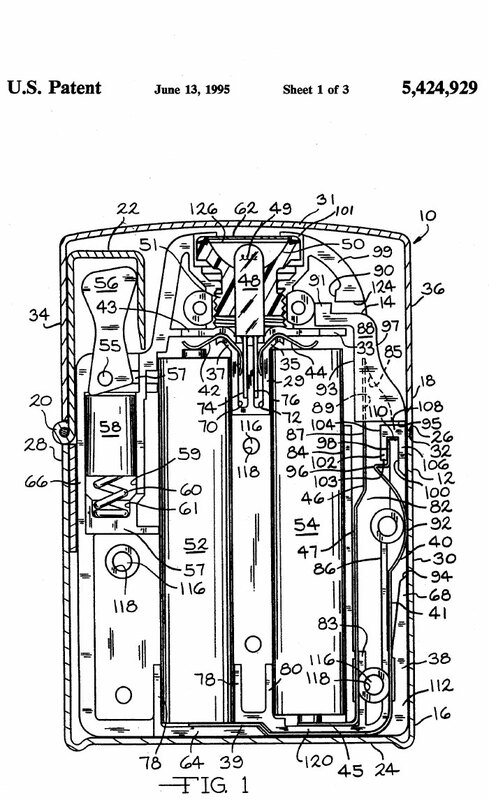 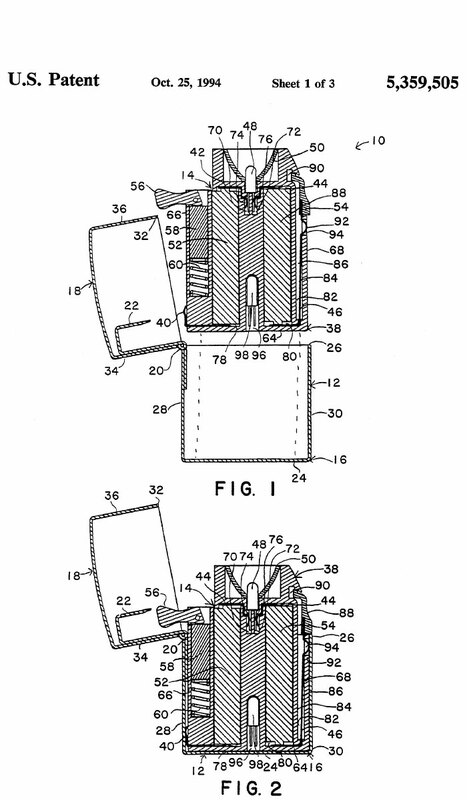 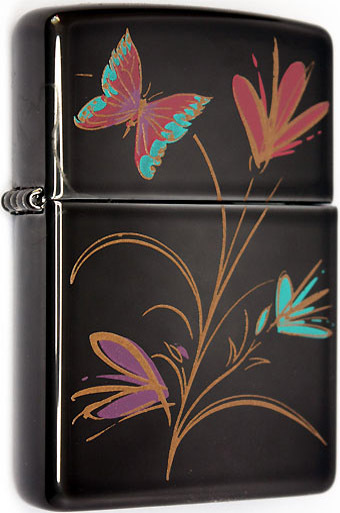 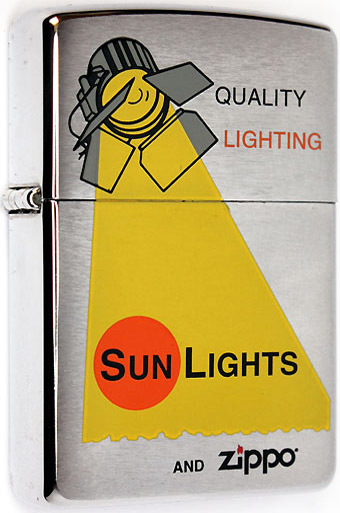 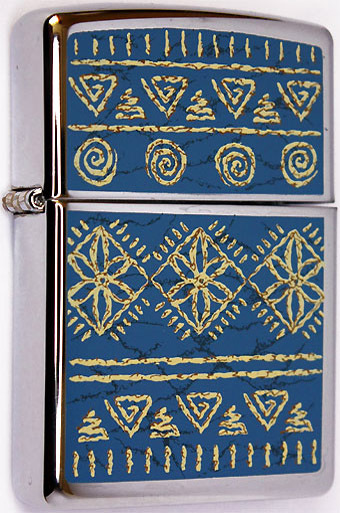 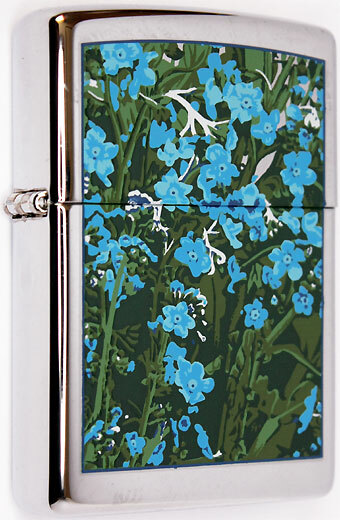 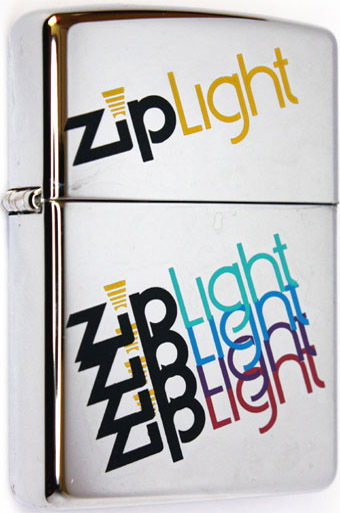 This Ziplight design was named "Betty Blue Bell" for Betty Lou Philips, who worked for the Zippo Mfg. 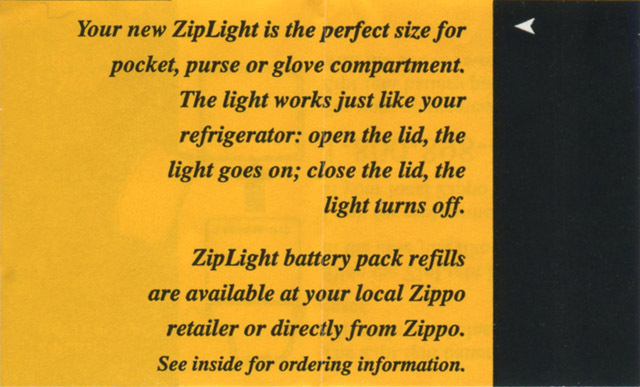 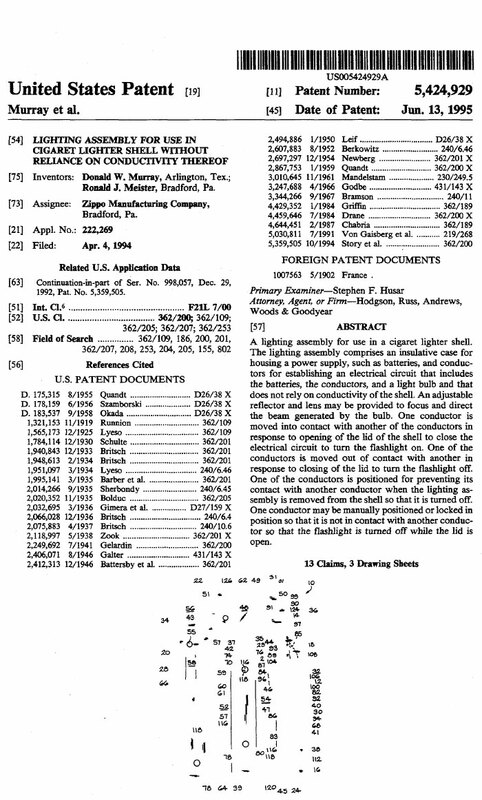 Co. for 43 years & was the administrative secretary to Pat Grandy at the time the Ziplight was introduced. 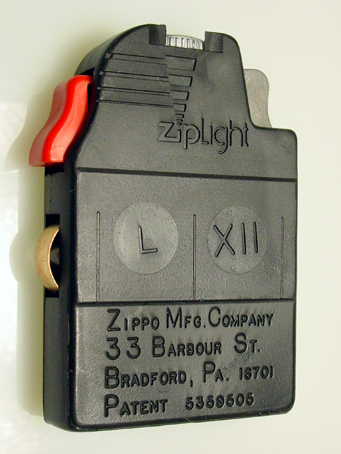 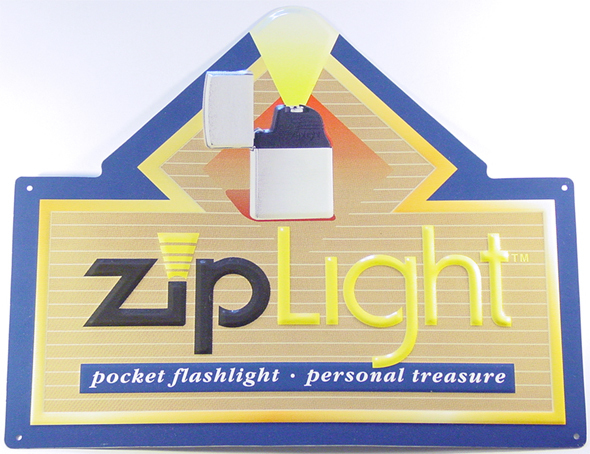 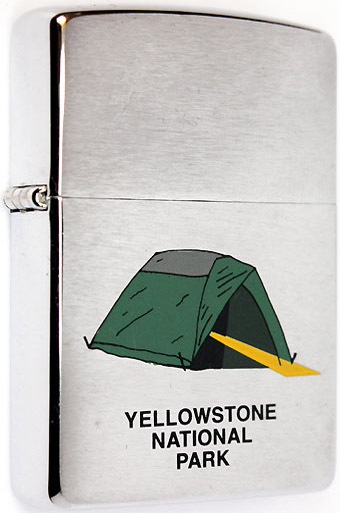 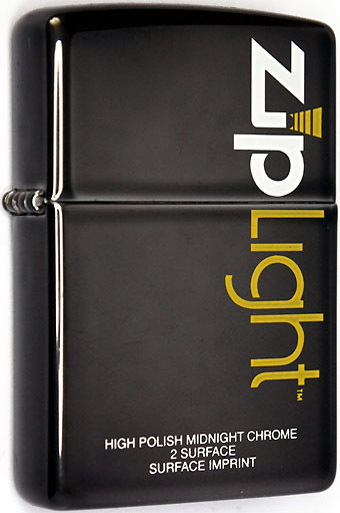 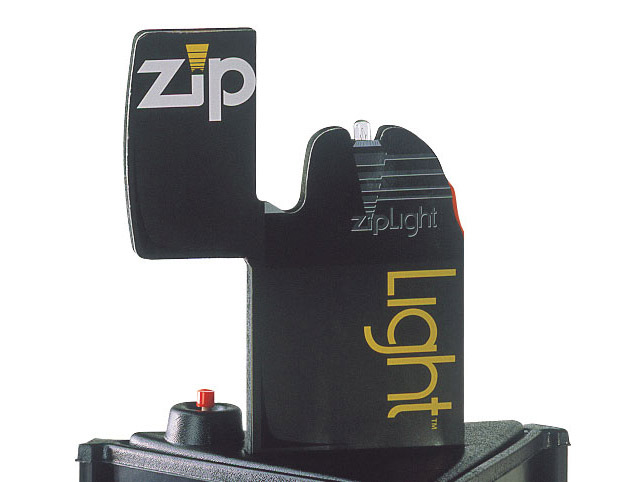 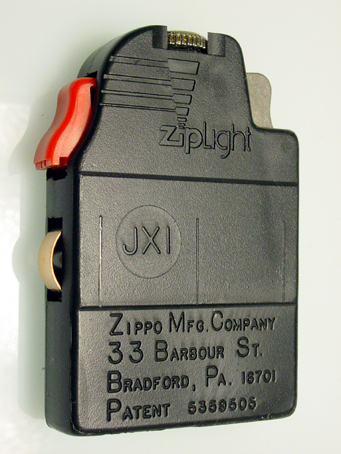 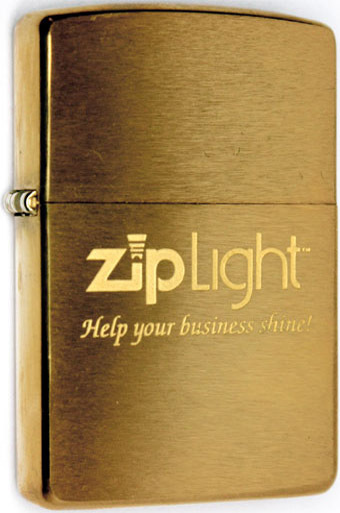 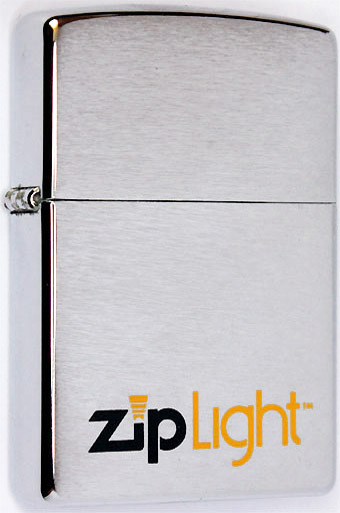 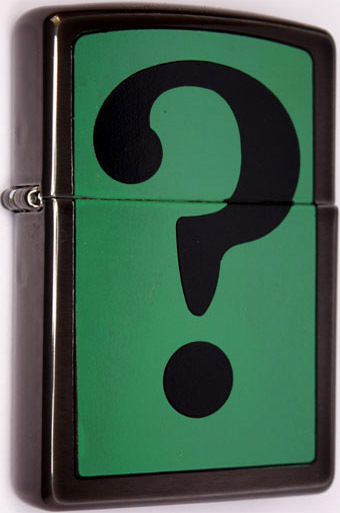 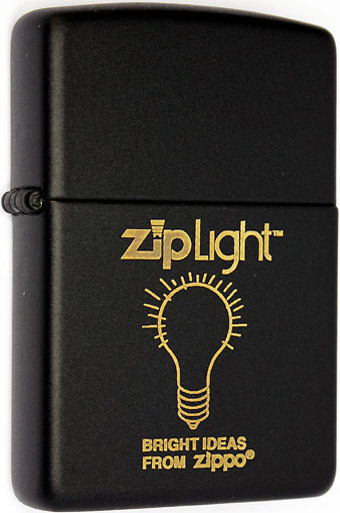 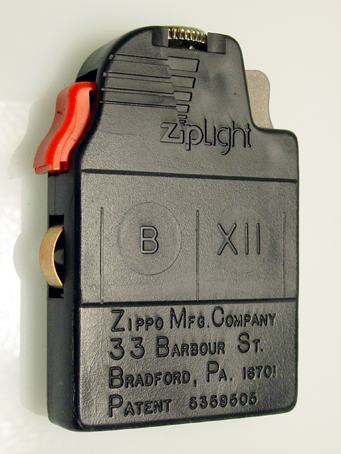 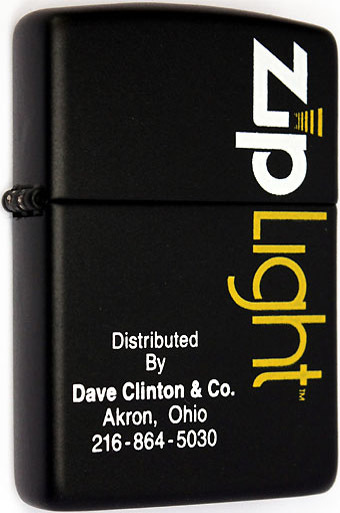 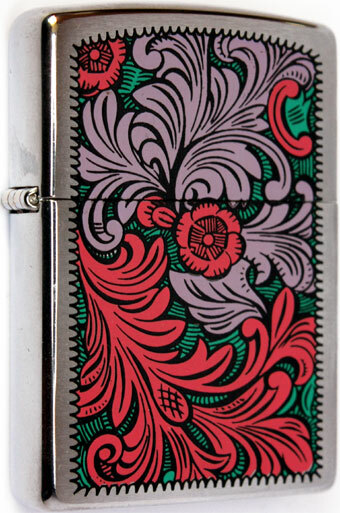 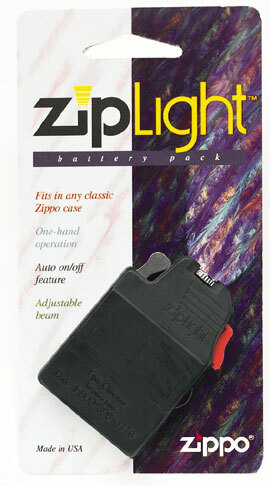 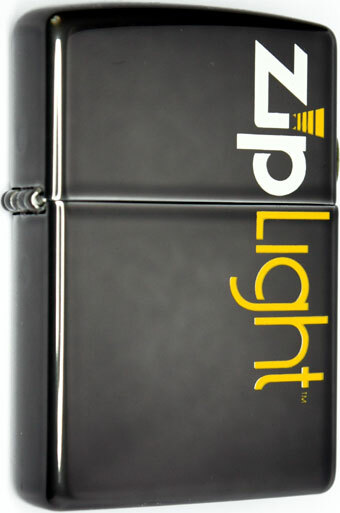 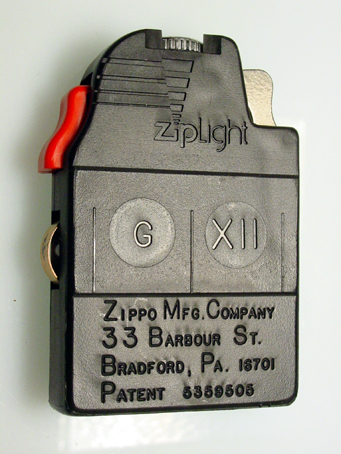 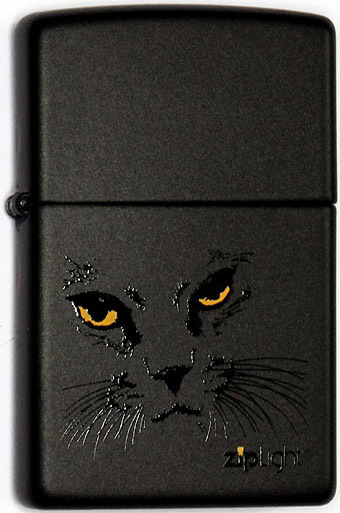 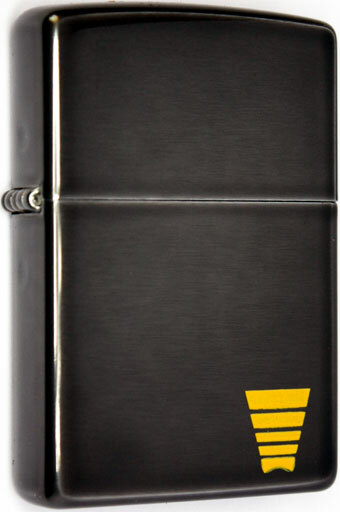 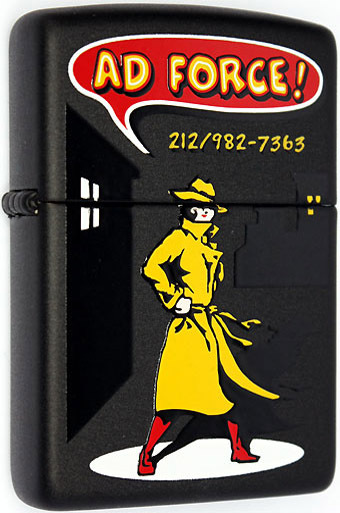 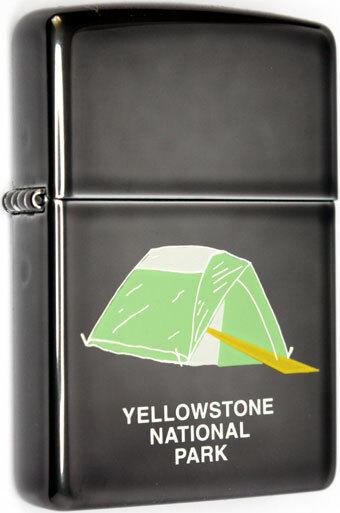 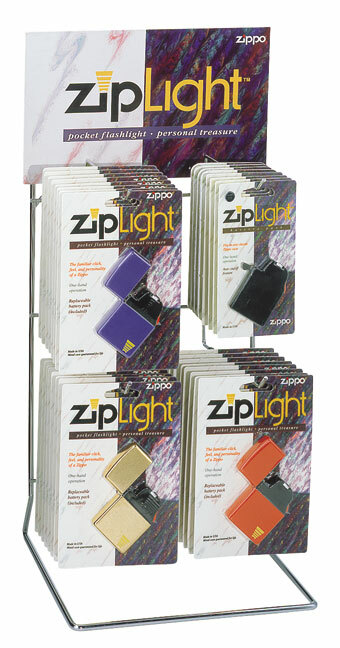 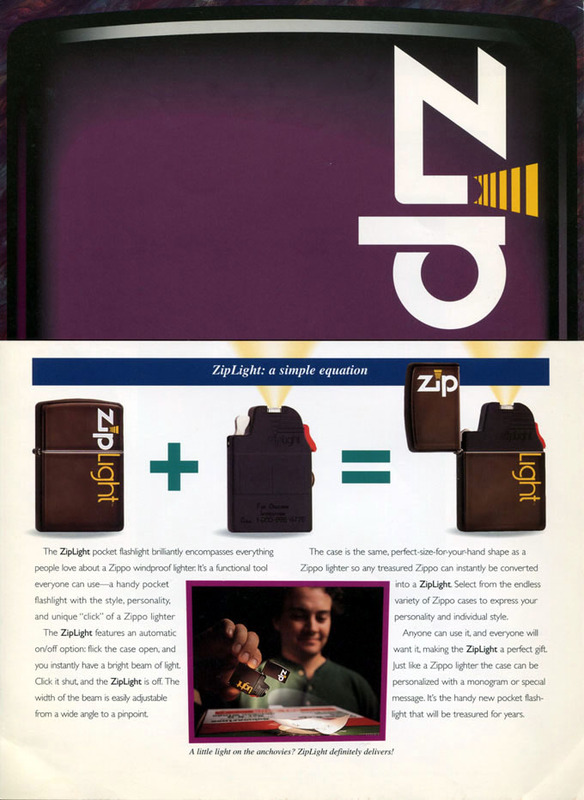 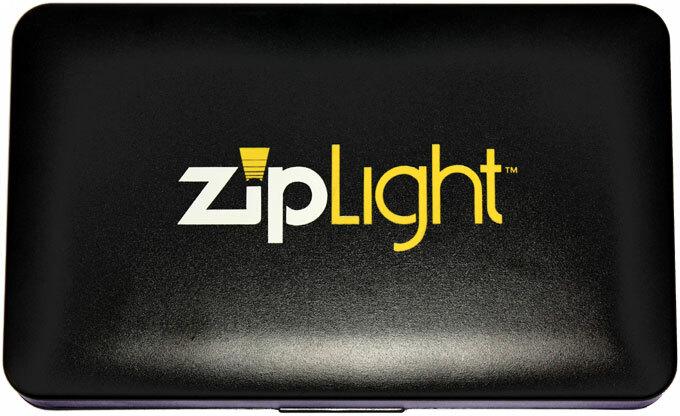 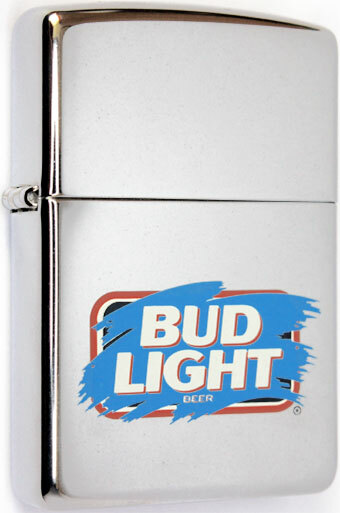 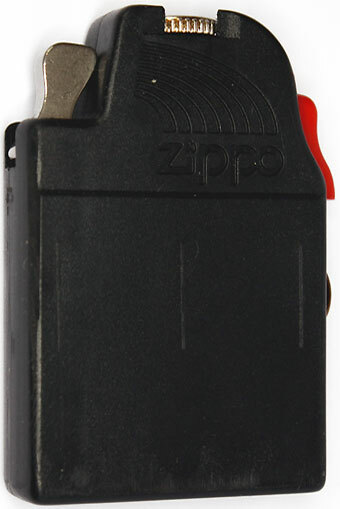 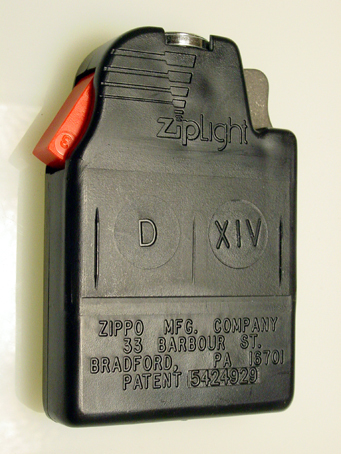 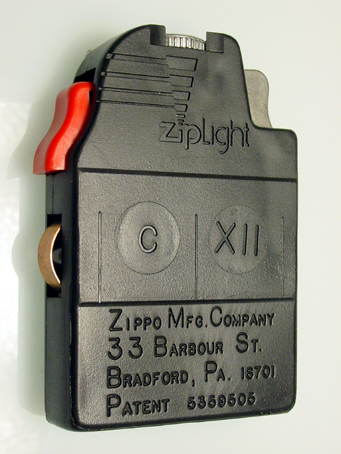 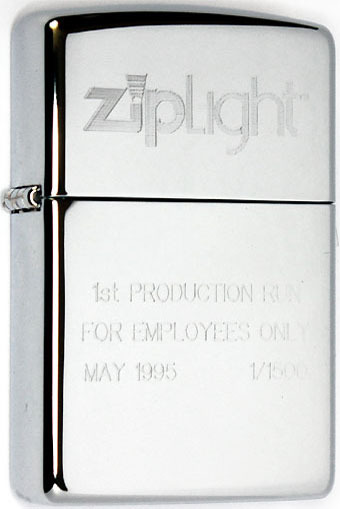 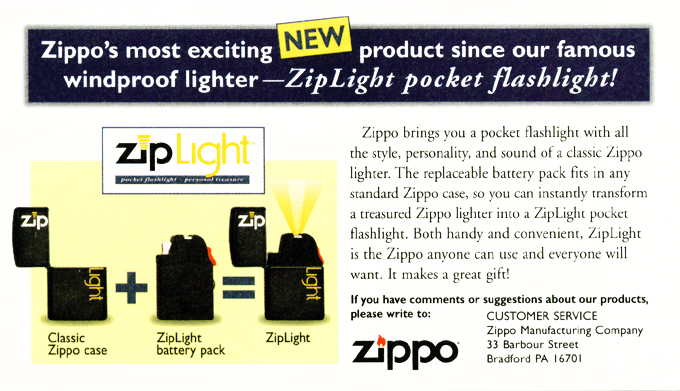 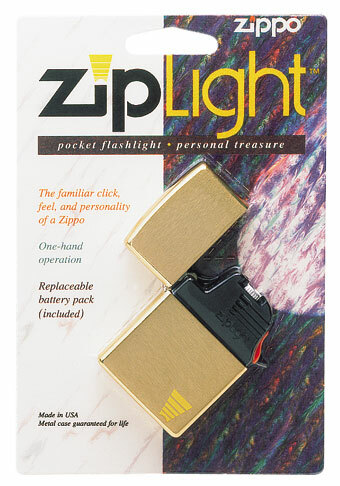 This small production run zipLight was given out to special guests visiting Zippo only. 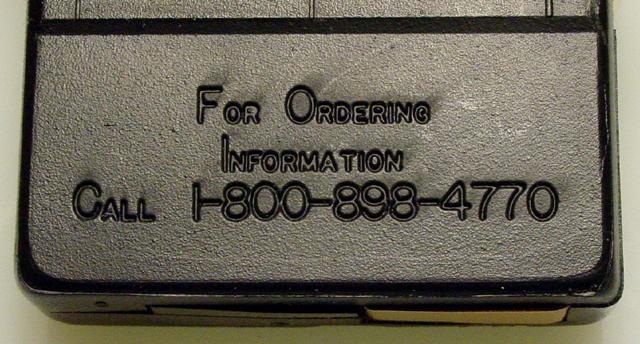 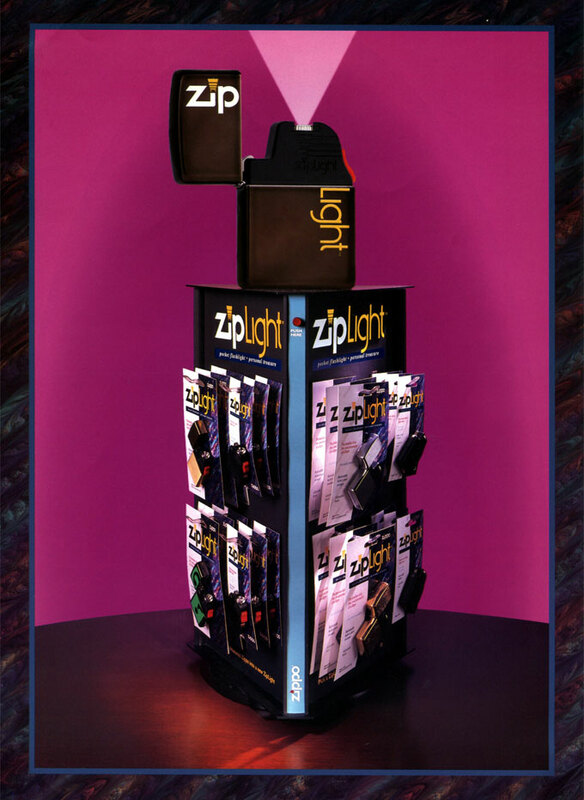 This display featured a large zipLight model that lighted up at the touch of the button. 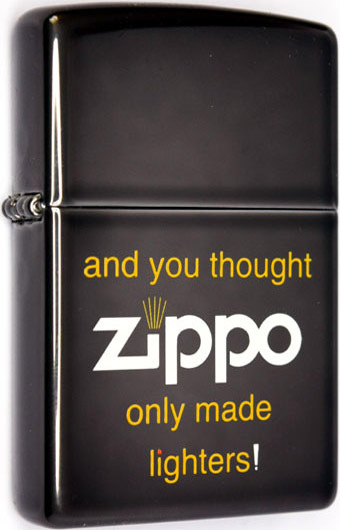 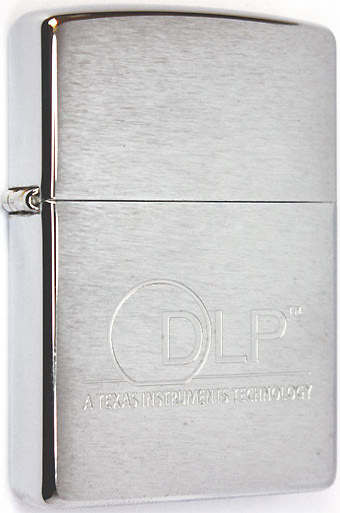 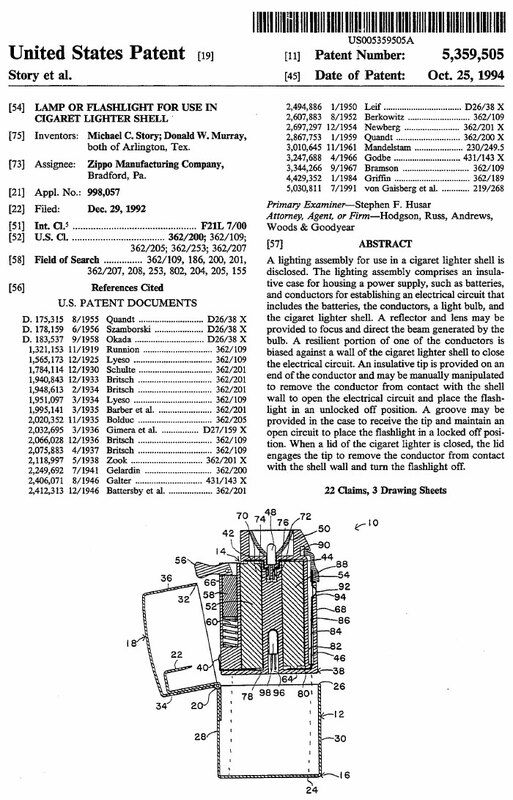 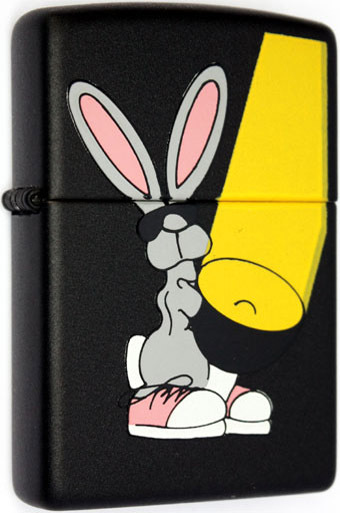 ZIPPO only made lighters ! 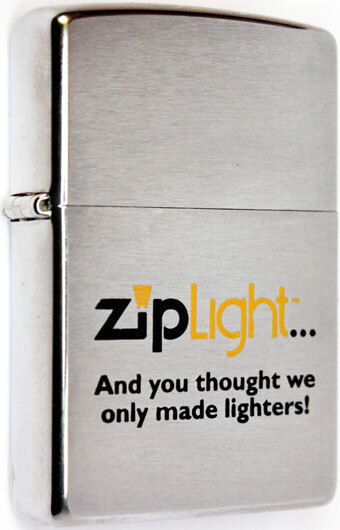 And you thought we only made lighters ! 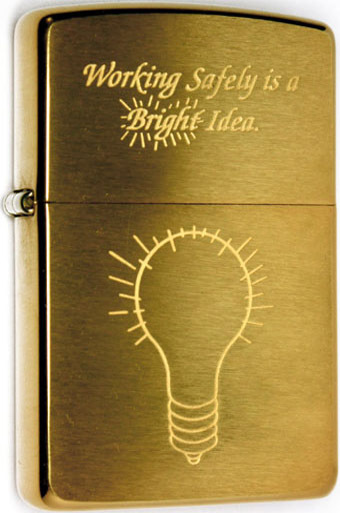 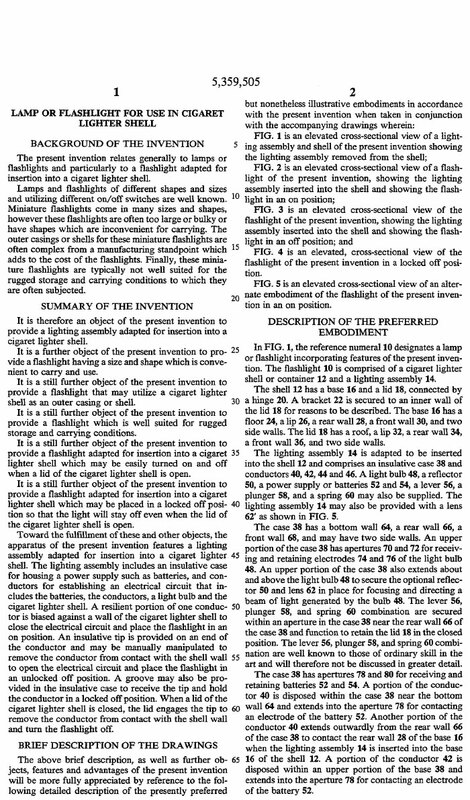 NEW Working Safely is a Bright Idea. 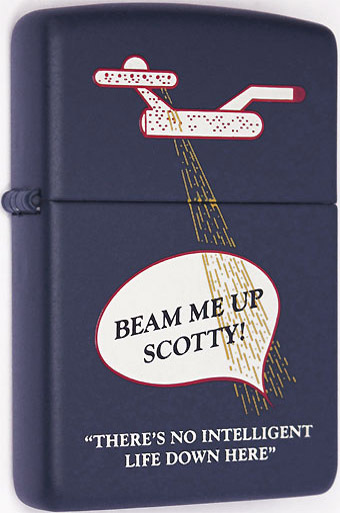 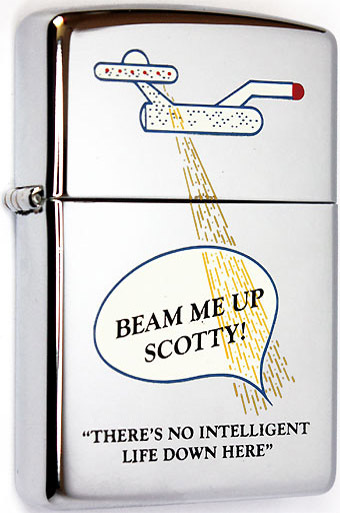 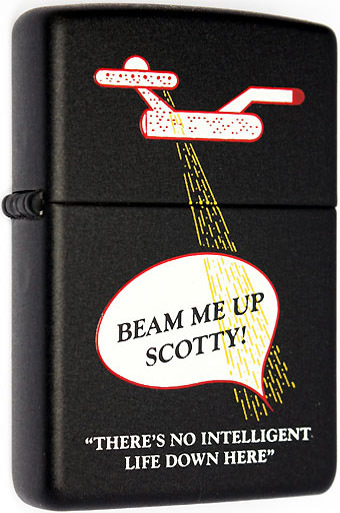 NEW BEAM ME UP SCOTTY! 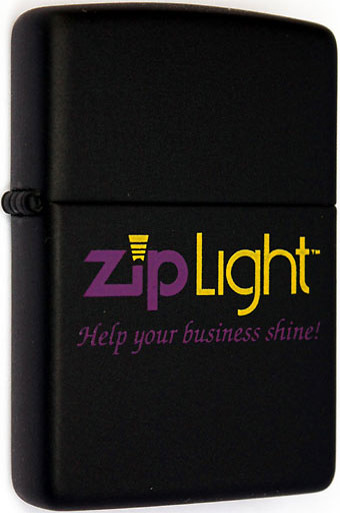 Help your business shine ! 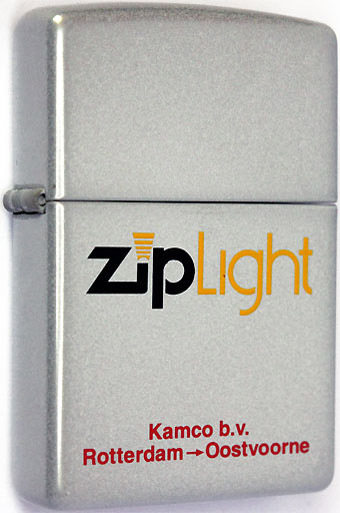 NEW zipLight - Kamco b.v. 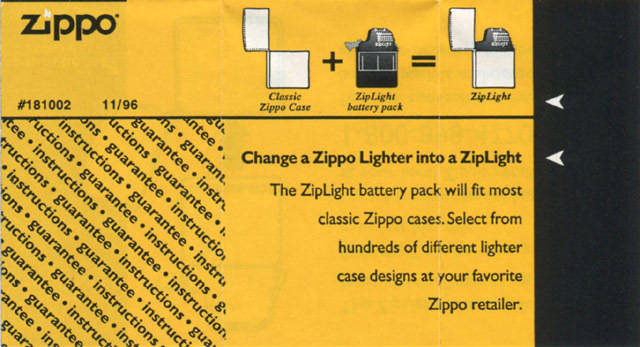 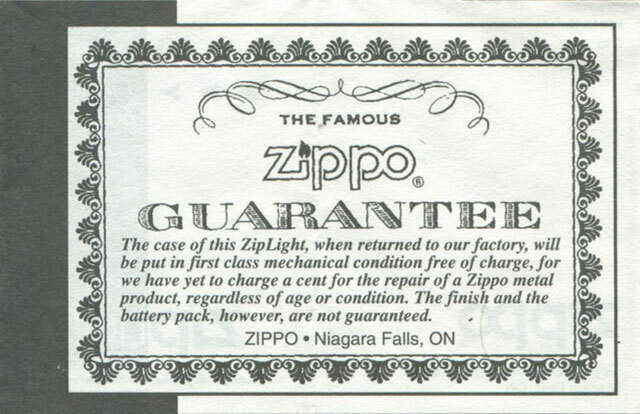 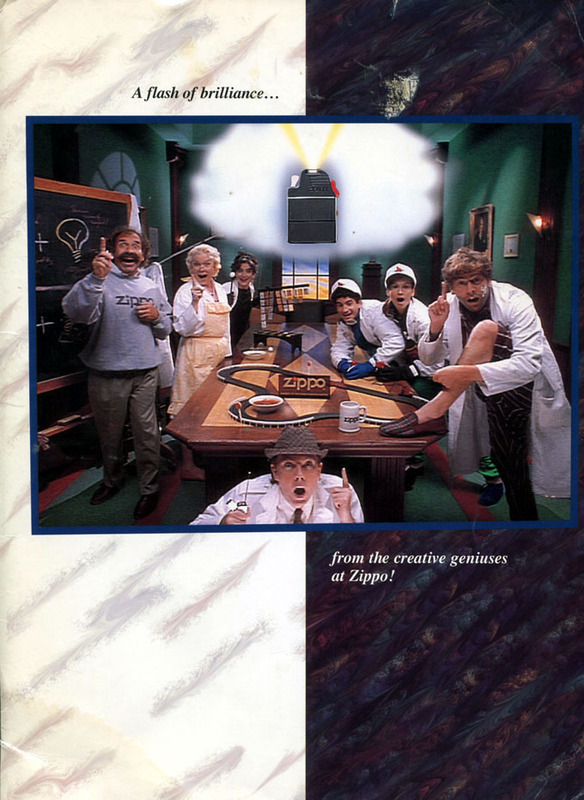 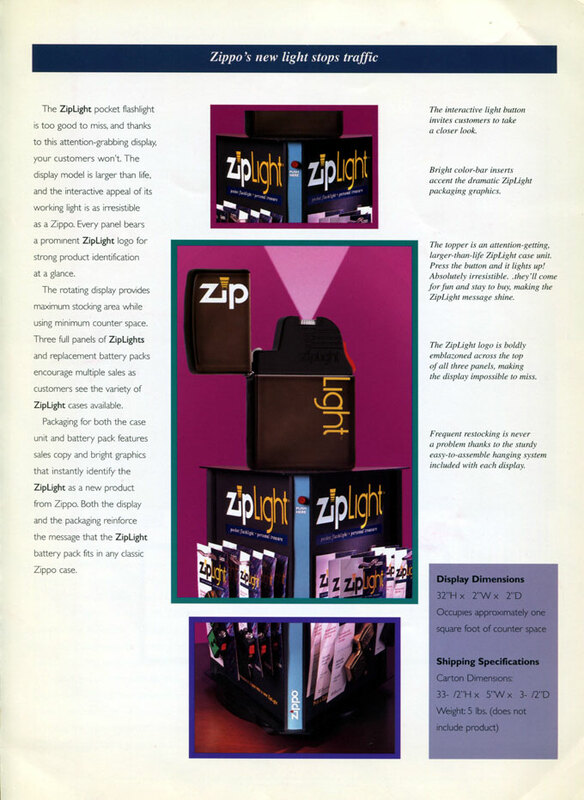 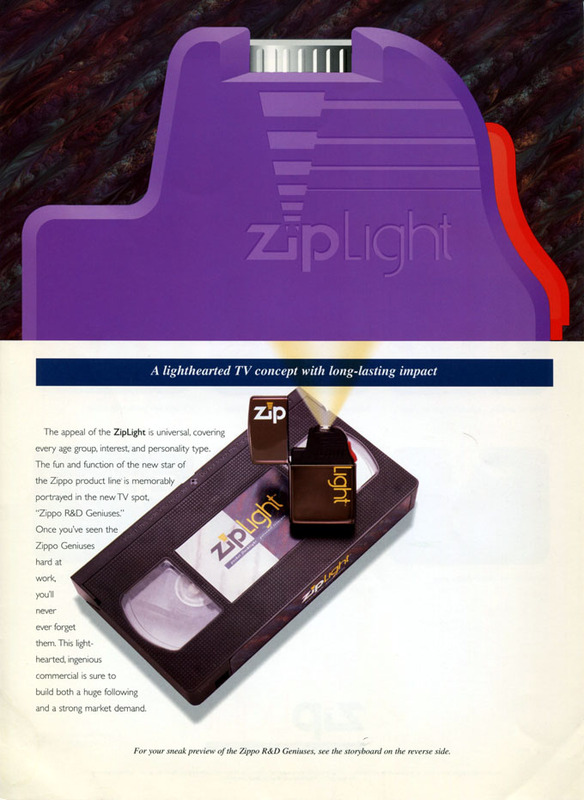 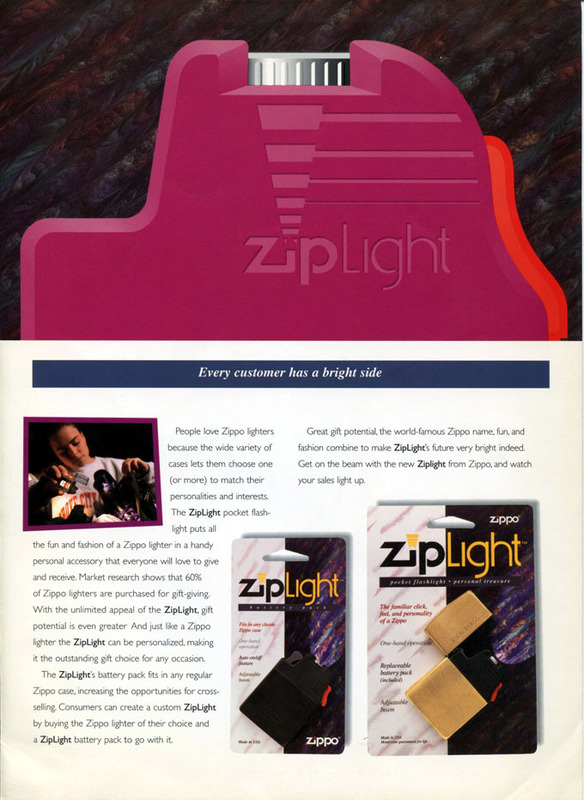 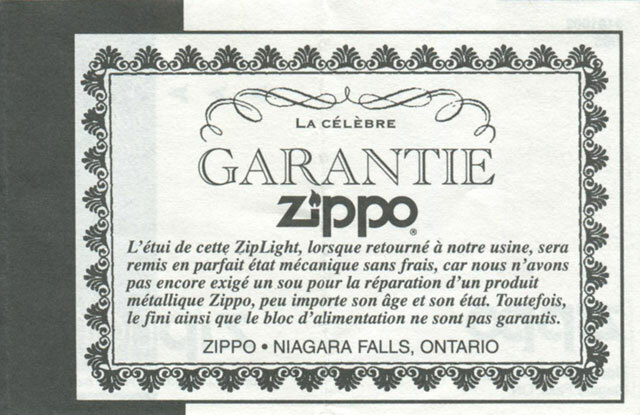 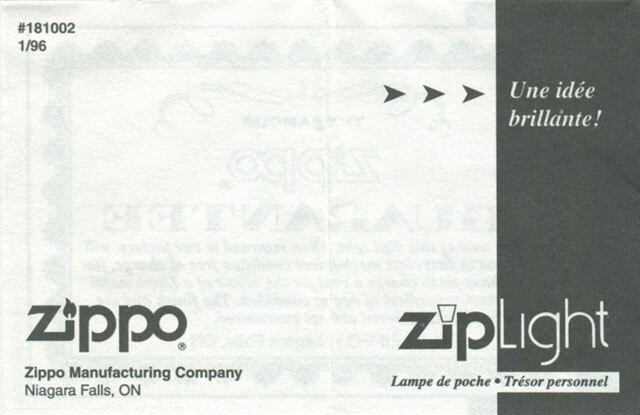 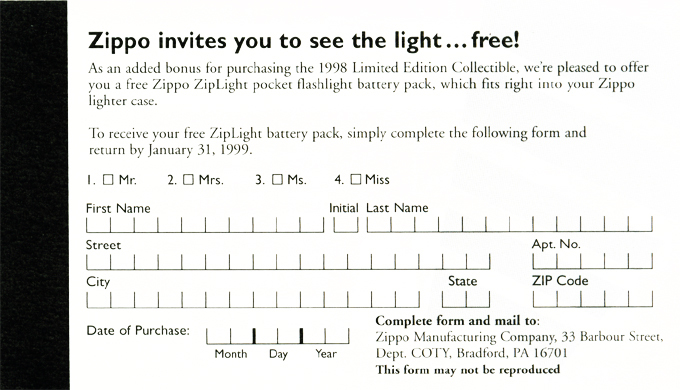 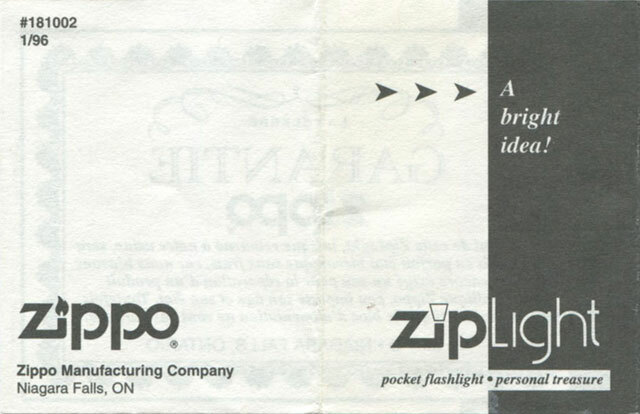 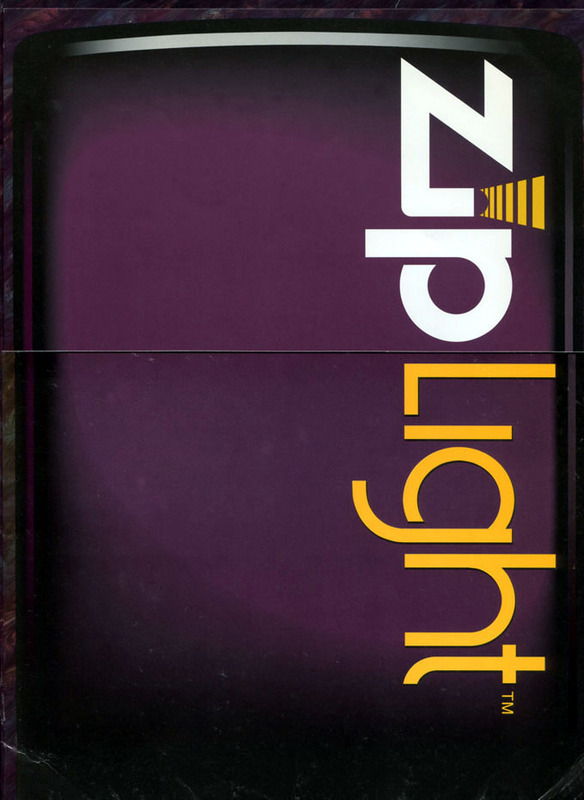 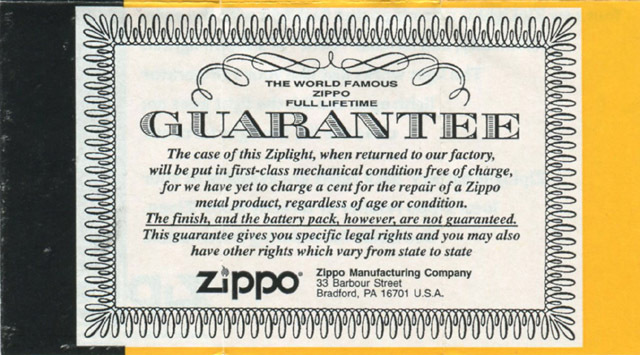 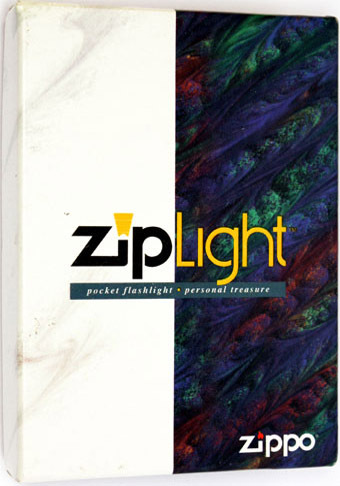 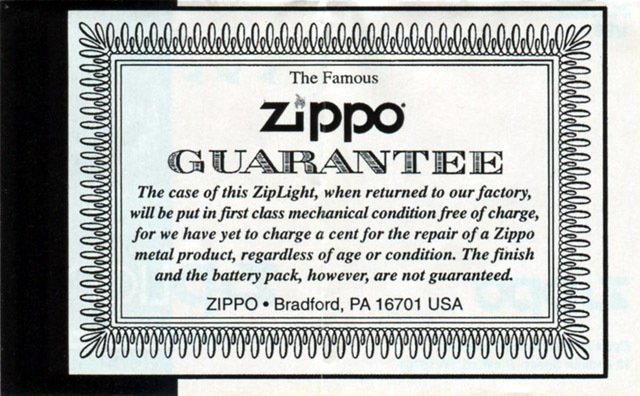 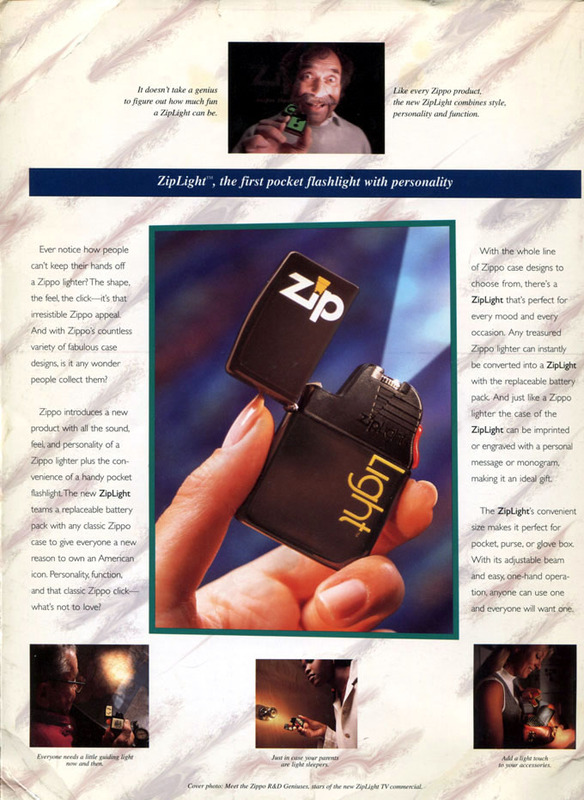 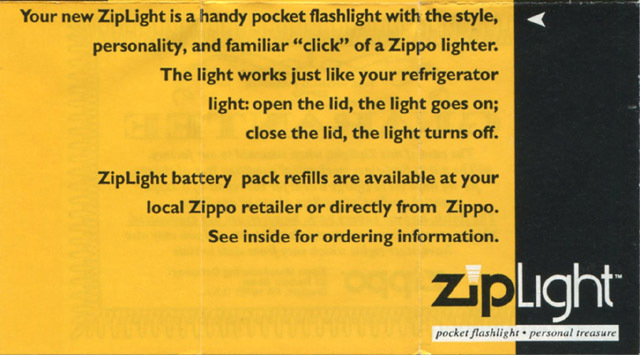 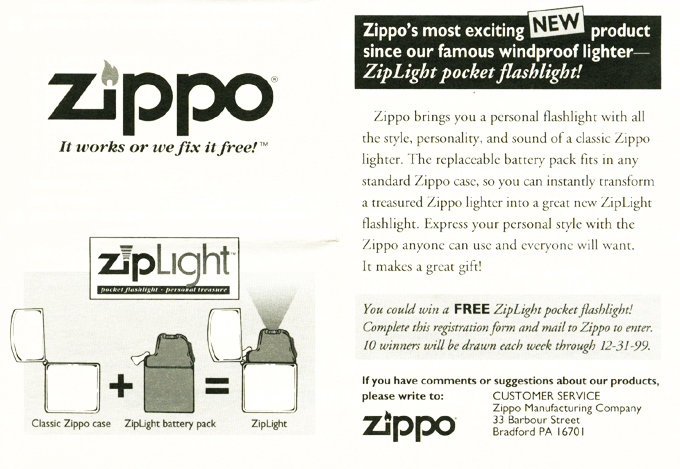 This voucher offering a FREE zipLight came with every limited edition collectible of the year 1998. 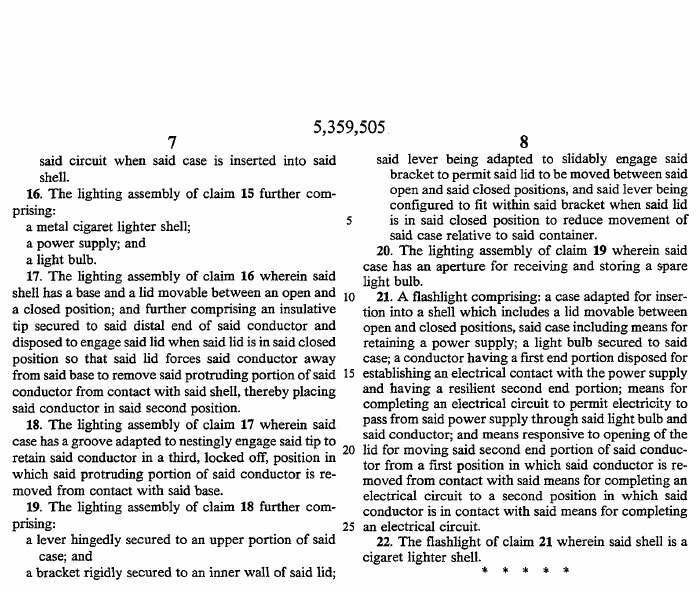 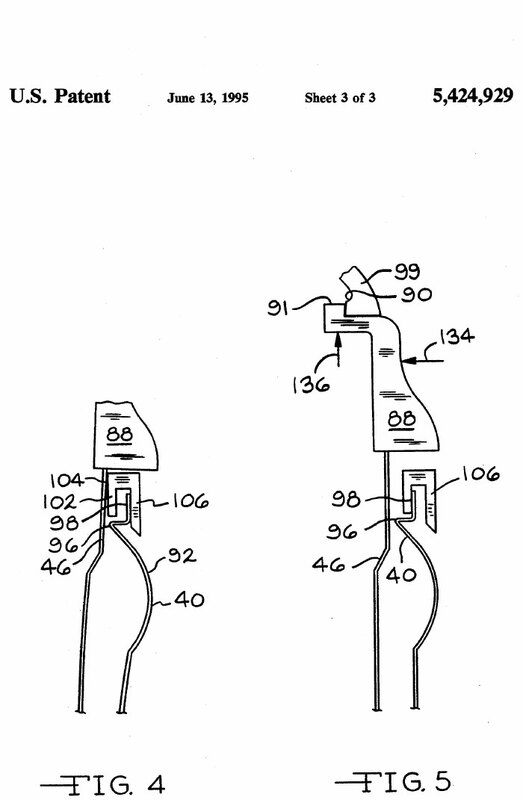 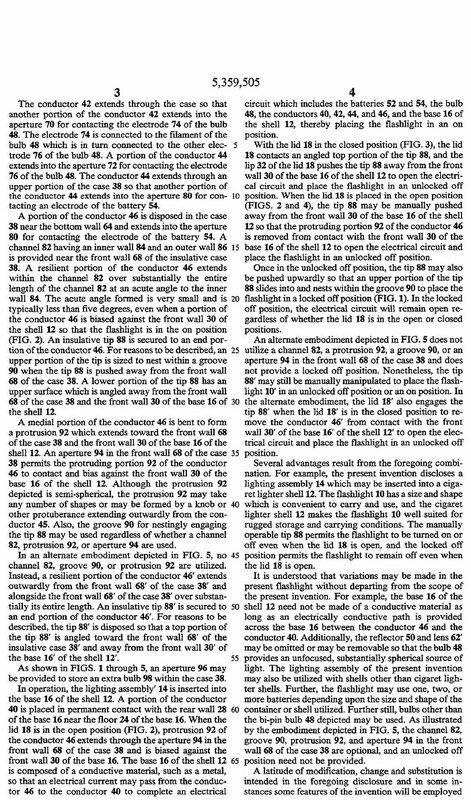 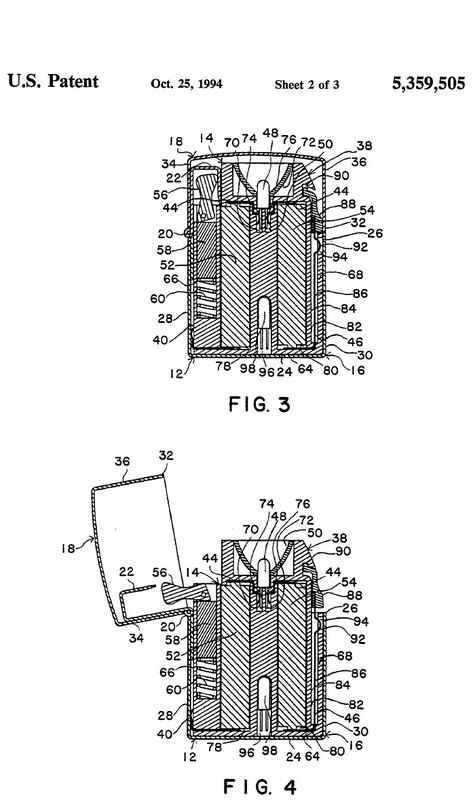 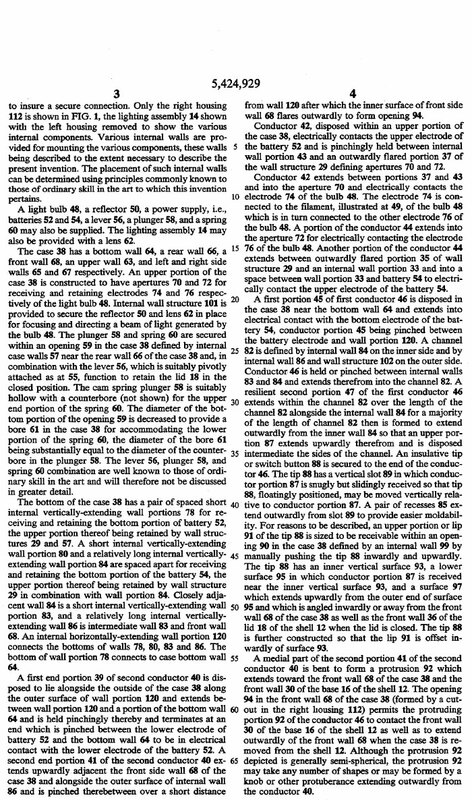 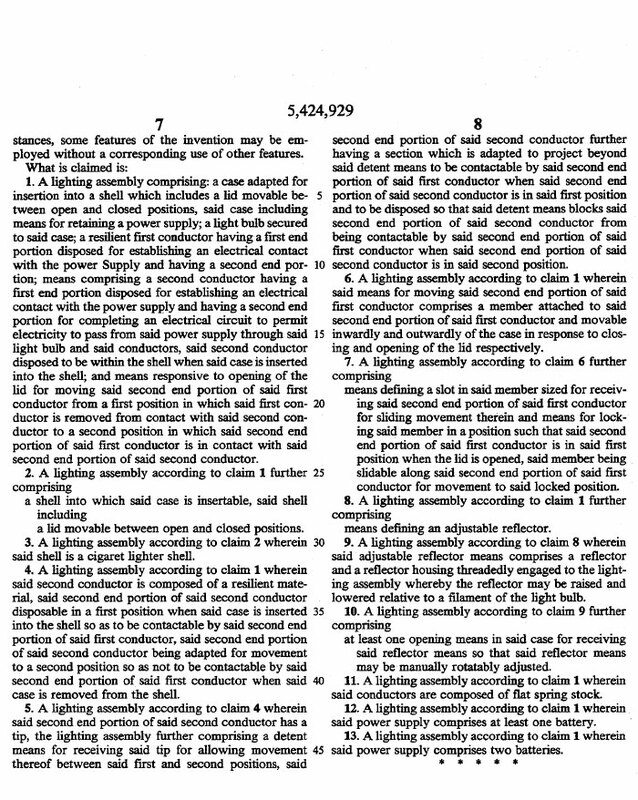 Comparing the inside units - patent #5359505 on the left & patent #5424929 on the right - the main difference is the adjustable light beam no longer available since 1997.